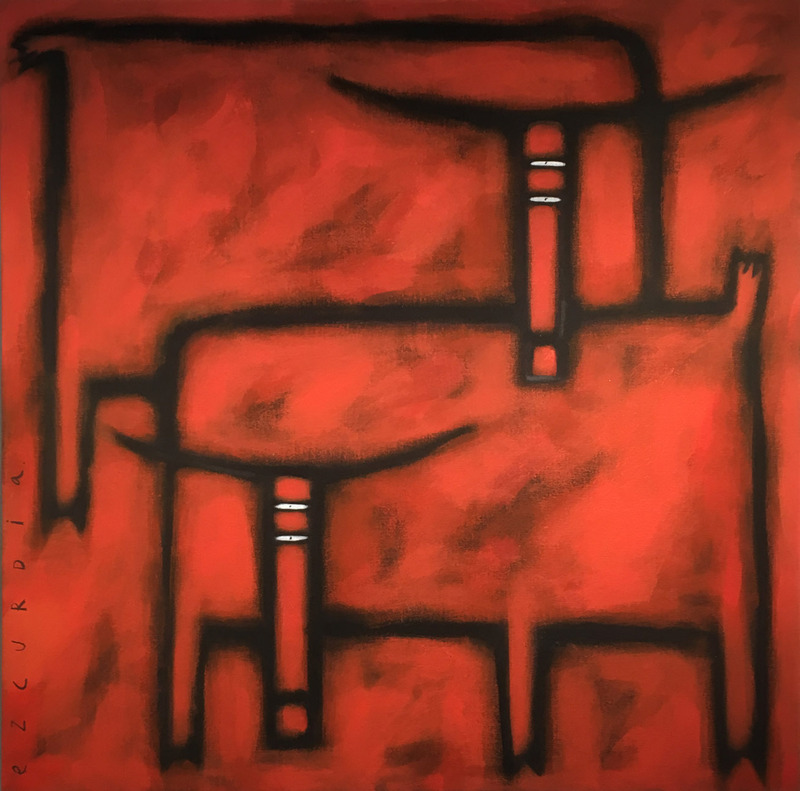 Mirada Fine Art is thrilled to introduce Mexican-artist Juan Ezcurdia! 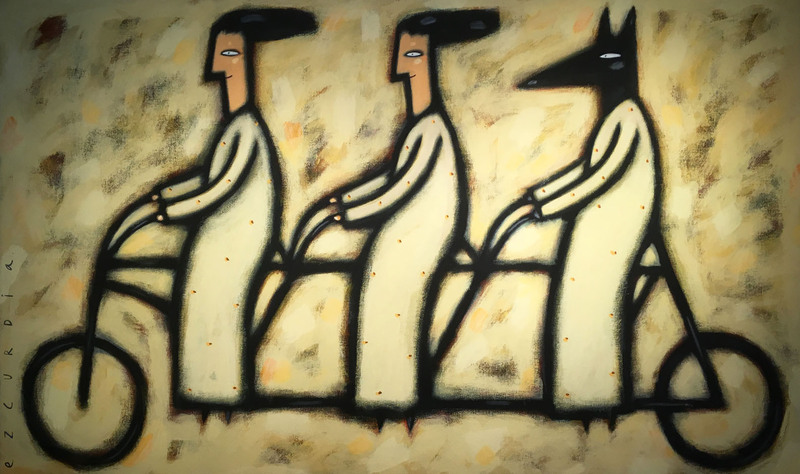 Juan Ezcurdia at Mirada Fine Art, 'Tres en Bici,' Acrylic on Canvas, 36" x 58"
Born in the most populated city in North America, Mexico City, Juan Ezcurdia was naturally drawn to the study of psychology as a young man. Painting was learned initially as a source of self-expression and stress relief. His innate talent was recognized almost immediately, however, and interest in his artistic work was meteoric. Acrylic on Canvas, 47" x 47"
Juan’s whimsical but professional creations led to an offer to illustrate children’s books, thus launching him onto his second career path. Recognized by Mexico’s Ministry of Art & Culture, Ezcurdia was awarded the country’s prestigious National Illustration Prize. Seeking to escape the frenetic pace of a huge city, in 1997 Ezcurdia sought refuge in the culturally-rich, art-centric hub of San Miguel de Allende, Guanajuato, Mexico. 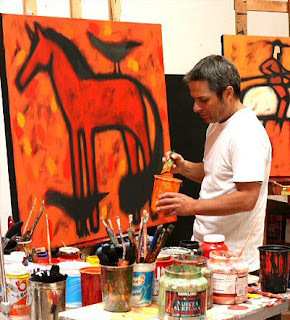 Juan Ezcurdia is recognized worldwide for his wholly unique interpretations of animals and people. His paintings, although rendered simply, are inarguably sophisticated in their sense of color, shading and composition. In his world, different species not only interact, they also coexist and intermingle on equal planes. It’s not unusual to have a woman and a bull in a three-piece suit enjoying a bicycle ride on a sunny afternoon. 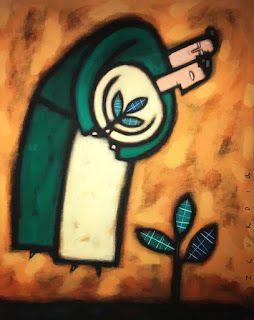 Humorous yet heartfelt, his figures are seemingly uncomplicated but the overall feel is undoubtedly polished and painterly. His style has been likened to a combination of Gary Larson the cartoonist meets the Masters of Art. 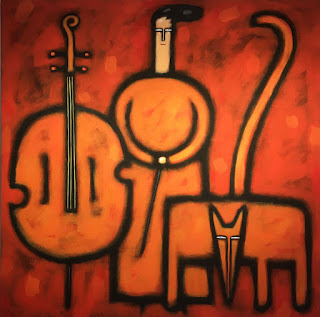 Acrylic on Canvas, 39" x 31"
Juan Ezcurdia’s work is shown throughout Europe, Canada and the Caribbean. Mirada Fine Art is extremely privileged to be the solo outlet to represent his work in the United States. 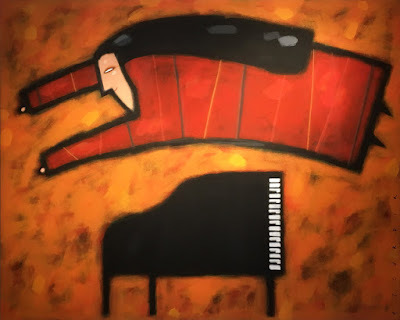 Acrylic on Canvas, 35" x 35"
Juan Ezcurdia at Mirada Fine Art, 'Pianista,' Acrylic on Canvas, 47" x 58"